It started with me creating a BootCamp partition (around 145 GB) for Windows 8 quite some time ago. I decided I will give 8.1 another go - as the partition was there and so I wanted to use it by trying to install over it again. I chose the EFI install and went for it, but the installer informed me that it will not install, because the partition has MBR instead of GPT. So instead of running the installer again in normal mode - I logged back into OSX deleted the BOOTCAMP partition (or so I then thought), ran the installer again in EFI and told it to create a partition for itself in the free space and install Windows. The installer created 3 partition - 1 large one and 2 small ones. I didn't like that so went back to OS X tried to delete those partitions, but that of course didn't work and my drive became messier and messier. By that time I knew I was not very smart about it and tried to delete all the partitions I thought I didn't need from the Windows Installer. I messed up even more... OSX stopped booting. I then read and performed steps from the above mentioned thread. But all along my diskutil list showed 2 physical volumes instead of 1. I don't know where to go from here? Why are there 2 physical volumes and what to do with them? If anyone could help I would greatly appreciate it. Theoretically everything is fine with your Fusion Drive. Fusion Drives look like this. Disk0 is your SSD with 121 GB and disk1 is your HDD with ~1 TB (~1.121 TB summed up). The larger parts of your SSD (disk0s2) and your HDD (disk1s2) are pooled to a CoreStorage LVG (Fusion Drive: disk3) with a size of 967.8 GB. The rest is reserved for EFIs, a Recovery HD (alltogether ~1.3 GB) and your old Windows partition - now probably free space (~152 GB). 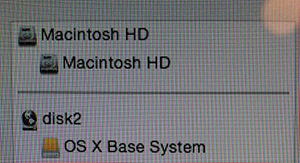 The logical volume 'Macintosh HD' (967.8 GB) spans disk0s2 and disk1s2. This is the first 'Macintosh HD' in picture 1. The volume 'Macintosh HD' - it's the one visible on the desktop - should ideally also have about 967.8 GB. This is the second 'Macintosh HD' in picture 1. In fact it has only 852.67 GB (see picture 3). In the second picture the logical volume 'Macintosh HD' is the first listed in black, the volume 'Macintosh HD' is the second listed in black, the other two 'Macintosh HD's listed in grey are the parts of your SSD and HDD dedicated to the logical volume 'Macintosh HD'. In my opinion something went wrong after deleting various partitions with the Bootcamp Assistant/Disk Utility or in Windows. Alternatively you may start from a bootable installer thumb drive (preferably Mavericks or Yosemite) or a thumb drive containing a full system (preferably Mavericks or Yosemite). First i would try to check the volume 'Macintosh HD' with Disk Utility. If the volume is corrupted consider a reinstall of Mac OS X. In your case: first diskutil mountDisk /dev/disk0 and diskutil mountDisk /dev/disk1 and then diskutil mount /dev/disk3. enter gpt -r -vvv show /dev/diskIdentfierOfApple_CoreStorage to get infos of your HDD CoreStorage disk. Calculate the maximal size of your CoreStorage Logical Volume in diskutil cs list: (size disk0s2) + (size disk1s2) In your case that's 120988852224 B + 996351459328 B = 1117340311552 B. That should be the size of your refreshed Logical Volume Group. Resize your Logical Volume with diskutil cs resizeVolume LVUUID LVGSize-128 MB In your case that's diskutil cs resizeVolume D237FFDC-7DA4-41D7-AC13-4CC7E5E8C0A0 1117212311552b. If you get an error (There is not enough free space...) choose a smaller size like 1117148311552b. 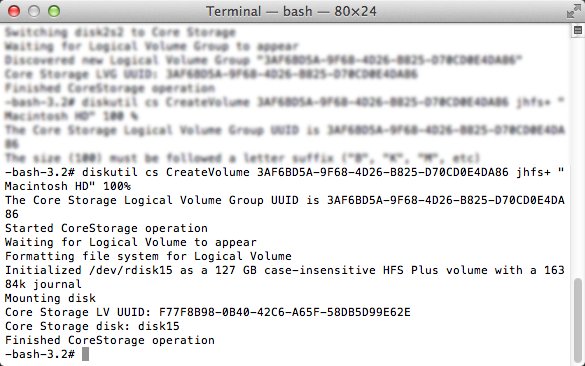 Quit Terminal and open Disk Utility. Check your expanded CoreStorage Volume for errors. diskutil cs list to get the CoreStorage listing. Copy the Logical Volume UUID, it's the fifth listed. Now delete the Logical Volume with diskutil cs deleteVolume LVUUID. In your case: diskutil cs deleteVolume D237FFDC-7DA4-41D7-AC13-4CC7E5E8C0A0. Copy the Logical Volume Group UUID, it's the first listed in the listing of diskutil cs list. Then delete the Logical Volume Group with diskutil cs delete LVGUUID. Open 'Disk Utility'. Enter 'Ignore' if you are asked to fix the drives. 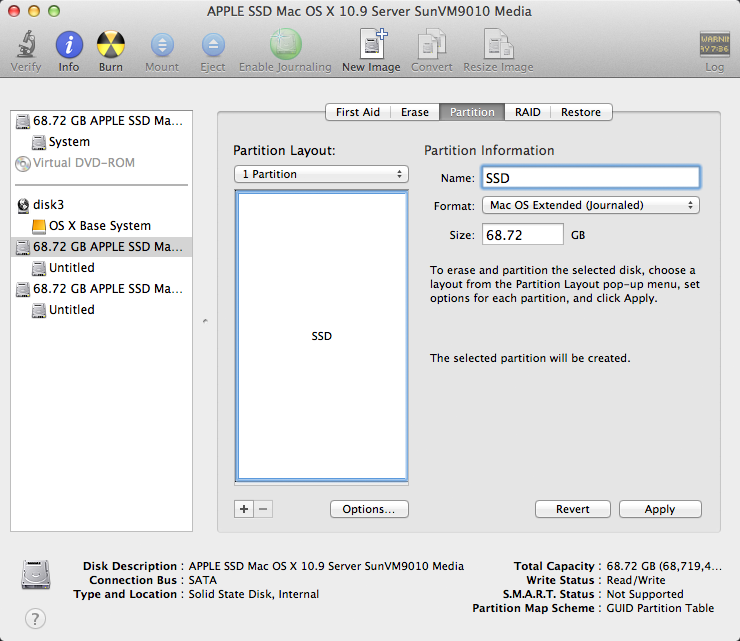 Choose your SSD and partition it: 1 Partition Mac OS X Extended (Journaled), hit the Options button and choose GUID Partiton table and hit OK and Apply. Choose your HDD and partition it: 1 Partition Mac OS X Extended (Journaled), hit the Options button and choose GUID Partiton table and hit OK and Apply. In your case probably diskutil cs create "Macintosh HD" disk0s2 disk1s2. Enter diskutil cs CreateVolume LVGUUID jhfs+ "Macintosh HD" 100%. Attach your external Time Machine backup drive or check this answer if you use NAS or another network share. Check if your 'Recovery HD' is listed. If your 'Recovery HD' is missing, usually reinstalling your current system with the latest available system installer (e.g. 'Install OS X Mavericks (10.9.5)' if Mavericks is currently installed) will recreate it without loosing any data. AFAIK Recovery Partition Creator 3.8 will NOT create a Recovery HD on CoreStorage volumes. After reinstalling the system with the latest available system installer open App Store and install the latest security fixes. Where did you fail? Where ever you could. The disks are GPT. Windows thinks they are MBR. Apple/Microsoft set it up this way. This means you can not use anything from Microsoft to change the partitions on the disks. If changes are going to be made to the partitions, the software used must come from Apple. The only exception is windows can format partitions. 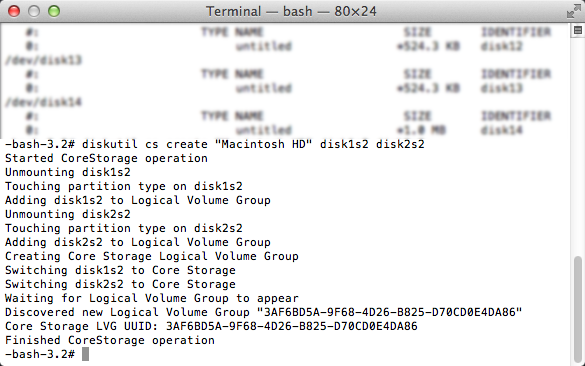 Now while the Disk Utility and the Terminal can be used to change partitions, there is no reason to do so. You should be using Bootcamp to create or destroy the windows Bootcamp partition. Bootcamp knows what it is doing, you don't. 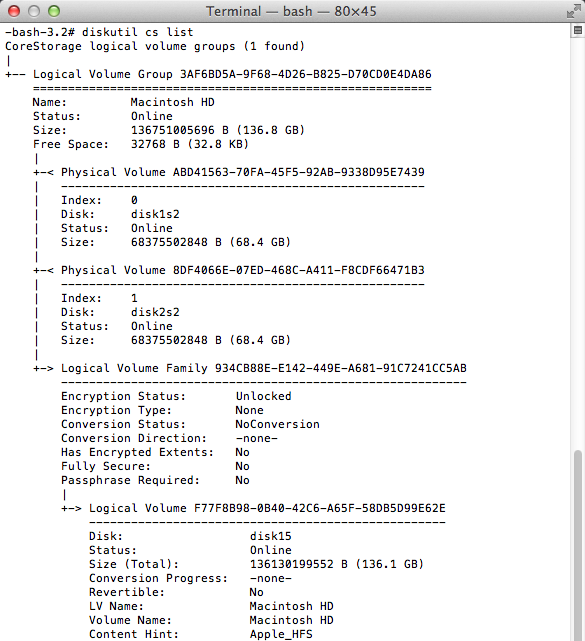 Your OS X HFS+ core storage partitions should have an id of AC. Windows partitions are type 07. 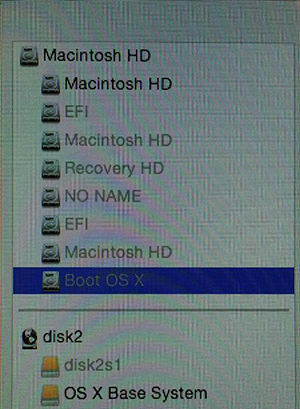 The efi partition is type EE and the OS X recovery partition is type AB. I am not using core storage. I would tell you do to do the same, except with a fusion drive you have no choice. I have found, the OS X partition can not be resize unless it is done while OS X is running. This is the opposite of what I would have expected. Using the disk utility to resize the OS X boot partition while booted to a recovery partition for me has resulted in failure. However, resizing is possible for both Windows and OS X, if you remove them from their partitions, resize the partitions and then restore them back to their partitions. I had the same problem after an attempt to install Windows 8.1 on my fusion drive. That wouldn't work since windows refused to use the MBR type partition created by bootcamp. Yosemite was running ok, there was just a 300Gb unmovable free space block. I could have left it as it was, but I decided to reinstall Yosemite booting from a USB install drive. It took about 2 hours, after that everything was working again. No free space, no extra little partitions (there were 13 of them), and the recovery partition was present once more. I made a fresh time machine backup just in case, but I ended up not even have to use it. This is consistent with report that the installer is cable of repairing fusion drive issues. When it prompts you to fix the drive, say yes. It will automatically rebuild the Fusion drive. Not the answer you're looking for? 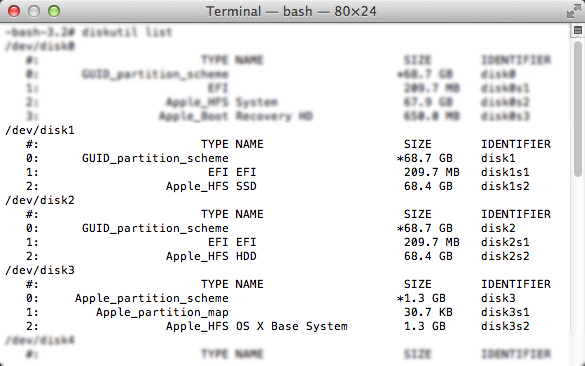 Browse other questions tagged hard-drive bootcamp disk-utility partition fusion-drive . How to restore system from network drive? How could I install Boot Camp drivers to my Windows partition?